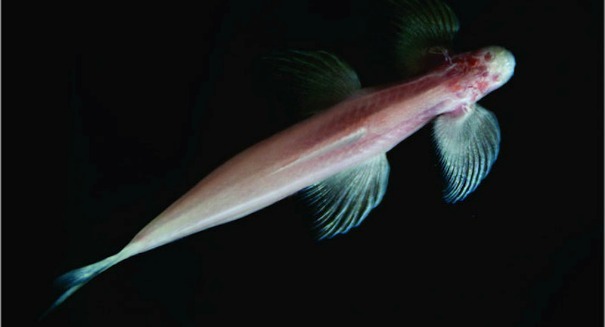 The cavefish in Thailand has some amazing attributes that are causing scientists to take a deeper look. As we reported recently, scientists have made a major discovery of a tiny fish in Thailand that has some unbelievable attributes and has the scientific world talking — but why is this creature so suddenly interesting to researchers? It has to do with what it can tell us about evolution. This blind, pink fish (Cryptotora thamicola) is able to walk on land and climb waterfalls almost like an amphibian using tiny limbs, suggesting that this may be an important evolutionary link between when sea creatures first started to transition onto land, marking a new era in species evolution that eventually led to us, according to a New Jersey Institute of Technology statement. The two-inch-long fish is found in northern Thailand in caves, and it is not found anywhere else on Earth. It can cling to both rough and smooth wet surfaces, supporting its weight with a pelvis and vertebral column, and may be a living fossil to a time when fish emerged from the waters 420 million years ago. This particular species of cavefish was discovered in 1985, but only now are scientists beginning to see the special significance of this species. Understanding how fish eventually transitioned on land is important to understanding evolution as a whole, which is what makes this species so exciting. It is such a fundamental shift from a marine environment to a land one that it would have required tremendous changes in evolution, so any insight into how that happened is valuable.